For as long as I can remember, I have had a “sprig of something” rooting in water on a windowsill. My mom did that. My grandmother did that. My Aunt Myrtle did that. This process never fails to wow me. Never fails to bring me great joy. I love being able to see the tiny roots form. Showing life. Showing rebirth. Showing re-creation. A good reminder of how simple the needs of a plant and a person can be. Strong roots that start growing slowly and get stronger as they continue to feed on things that are good for them. Basic things … like water. On my potting shed windowsill today I have Coleus, Mint, Wandering Jew, Unidentified Trailing Plant, 3 African Violets (that are just about ready to be potted up) and Lavender (lavender roots best if you get down to the woody part of the stem)! Not every plant will root in water. Many things I have tried just rotted. Today I returned home from California to see roots on something I have never been able to root in water before! For the very first time, I have roots on a Rugosa Rose cutting! I am just over the moon about this one. Last week when I walked into my daughter’s California kitchen, guess what I saw. Do you like to put “sprigs of something” in water? For most plants, sun will definitely help! For African Violets, I just take a leaf and suspend it in water. Small jam jars covered in plastic wrap secured with a strong rubber band will do the trick! Cut a slit in the plastic wrap. Keep putting down deep, strong roots and Happy Bloom Thyme Friday! Potting Shed Review: Move Over Christmas Cactus! Move over Christmas Cactus, we’re moving back in says the geraniums, a few herbs and some roses! Space in the Potting Shed is limited and there’s a bit of overcrowding happening! Just when the Christmas Cactus is getting ready to bloom and show its stuff, here comes the 24 degree nights and all the “others” seeking shelter from the cold come running in. It is a bit of a family reunion as some of these geraniums have been around for many, many years. They get huge every summer and grace the deck and potting shed porch with their lovely blooms. In late fall they get a “hair cut” to help them fit their winter space. The best thing about it, they recover quickly and go back to blooming and bloom most of the winter! The bay tree just about stayed out toooooo long as some of the leaves are nipped. He’ll need a bit of Annie’s Moo Poo tea to “recover.” I’m brewing up a fresh batch to soak the amaryllis bulbs in and get them planted this week! Some years I plant one or two amaryllis bulbs and sometimes I plant a dozen! For tips on growing amaryllis, read on here. They are super fun! 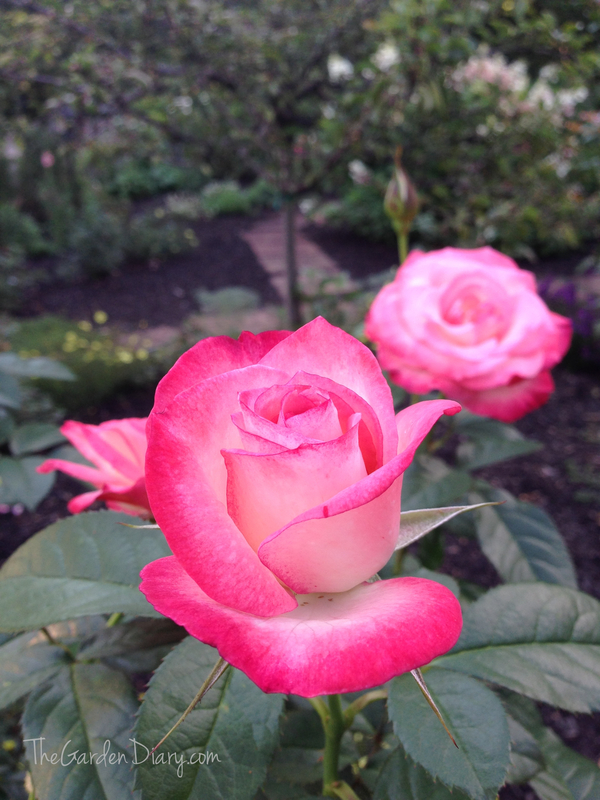 There’s a collection of roses … starts of the Peggy Martin rose from this summer’s Rosefest. 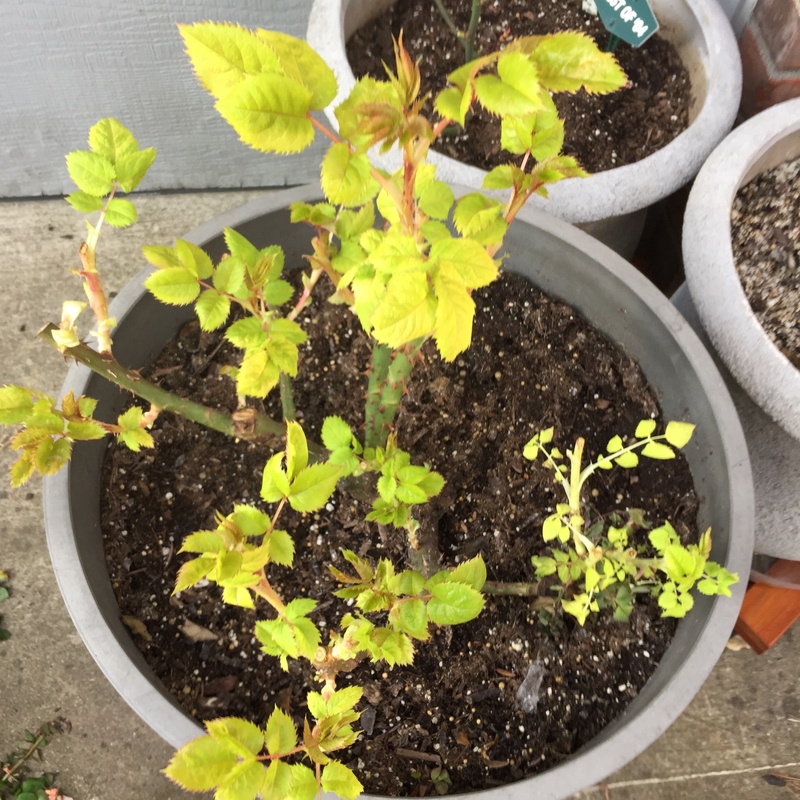 A healthy start of David Zlesak’s Above and Beyond, a beloved start of Barbara’s Pasture Rose (more about that coming soon) and even a tiny Beverly HT that was left behind in a corner over the summer. And, there are jars of cuttings of various annuals I don’t want to lose completely! When winter approaches I typically bring potted plants I want to save into the Potting Shed where there is controlled warmth and light (geraniums, mint, lavender, etc. ), except for my large potted roses, they are taken to the garage (no windows). The roses go dormant and “spring” back to life in the spring. Because of “over crowding” in the Potting Shed, I took this pot of herbs to the garage too. Last week I brought the pots out of the garage and couldn’t believe how well these herbs sprang back to life. They never lost their “green” completely and now they look almost robust! Today they are outside getting some sunshine and intermittent light rain. Let the thriving begin! The roses left in the garage are doing quite well too. 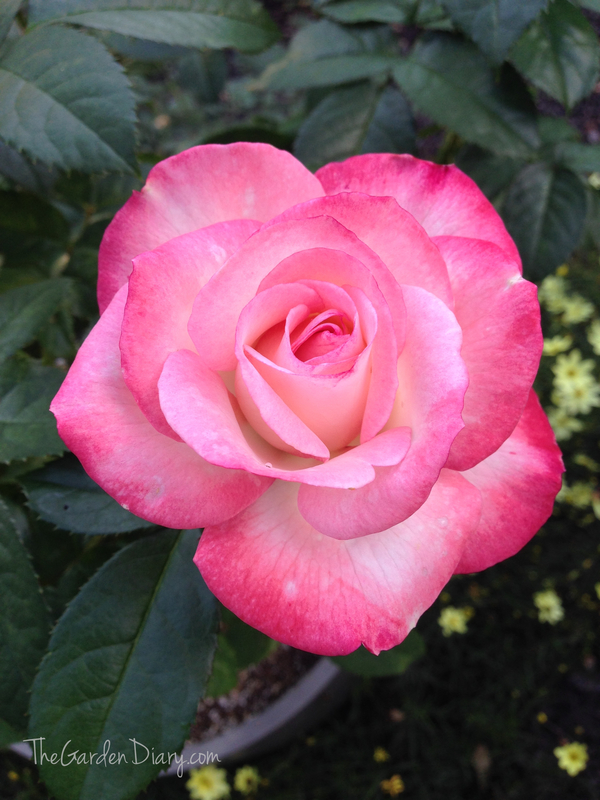 I typically cut any spindly growth completely back and let the roses start fresh. But this one is recovering so fast that I may do minimal pruning and she how she does. Meet the “winter in the garage, in the dark version of the Coretta Scott King” rose. Anemic though she may be, I think we are going to start from here and see what she does.